The prime minister can rest a bit easier now. We have stopped Iran from completing that second stage. The International Atomic Energy Agency, or IAEA, confirmed last week that Iran had effectively eliminated that “second stage” of uranium enrichment, as required by the interim deal negotiated between Iran and the United States, United Kingdom, France, Germany, Russia and China. And news reports over the weekend hinted that a second path to the bomb may be blocked as well. But first things, first. The first stage: they have to enrich enough of low enriched uranium (3 to 5 percent enriched uranium). The second stage: they have to enrich enough medium enriched uranium (20 percent). And the third and final stage: they have to enrich enough high enriched uranium for the first bomb (90 percent). The reason is that 20 percent uranium can be fed back into Iran’s centrifuges and rapidly turned into bomb-grade. One of America’s leading experts on Iran’s nuclear program, Greg Thielman of the Arms Control Association, explained in 2012: By the time Iran acquires approximately 225 kilograms of uranium gas…enriched to this level, it would be within one month of being able to further enrich to the 90 percent required for producing the metallic core of a nuclear warhead – assuming it takes 25 kilograms of material for one bomb. When Netanyahu spoke, Iran had roughly 190 kilograms of medium enriched uranium and was making more every week. “That’s why I speak today with such a sense of urgency,” he said, “And why everyone should have a sense of urgency.” He predicted Iran would cross his red line by the summer of 2013. It did not. 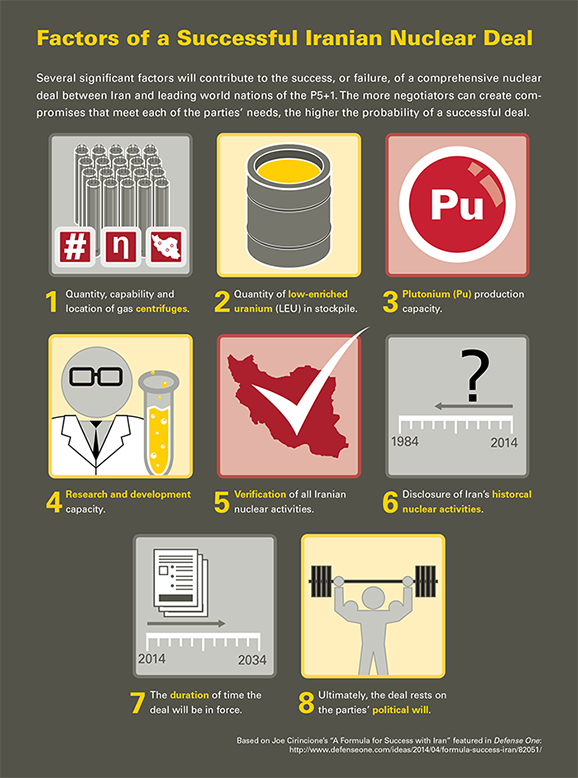 When Hassan Rouhani became president of Iran in June 2013, he stopped expanding Iran’s uranium enrichment capability. The interim deal the U.S. and other nations secured with Iran last November rolled it back, directly addressing Netanyahu’s main fear. Iran agreed not only to stop enriching uranium to 20 percent, but to get rid of all it had made. Read the rest of this article at Defense One.